The program enables the user to dynamically align a new or existing Text or MText object to a selected curve, with intuitive placement controls available at the command-line. The program may be used to align an existing text object in the drawing, or the user may create a new text object by specifying the text content. Multiple copies of a text object may be aligned to the selected curve if the 'Multiple Text Mode' is enabled in the Settings menu. Text is dynamically aligned in real-time, with the text offset & rotation relative to the curve controllable by the user. With the 'Readability' setting enabled, text is automatically rotated to preserve readability and will never appear upside-down. 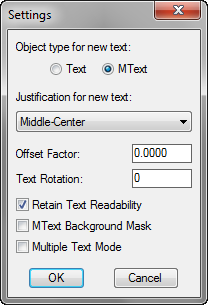 When using the program to align an MText object, the MText Background Mask may be toggled on & off during text alignment. Furthermore, these objects may be primary objects in the drawing, or nested (to any depth) within a block or xref. The program will also perform successfully under all UCS & View settings and with Annotative Text Styles. For a full description of the program, view Align Text to Curve at Lee Mac Programming. Align Text to Curve is brought to you by Lee Mac Programming. It's free.